In any war there are always people who, rather than pick up an AK 47, will take the difficult route of active peacemaking. There are individuals in the midst of the violence in Afghanistan, Northern Ireland, even in the D.R. Congo, who are risking their lives to prevent other people getting killed. This book tells their stories. Featuring sixteen personal testimonies by those who have summoned up the courage to transform violence in their lives, Unarmed Heroes is an inspiration as well as a handbook for overcoming conflict. The contributors, drawn from all over the globe, include relatives of those who died in the World Trade Centre attack and the Oklahoma bombing; Israeli, Palestinian and Afghan peace activists; a former IRA bomber and the daughter of one of his victims; a British military commander turned anti-nuclear campaigner, and many others. Despite their diverse backgrounds, each shares a passion for working actively but peacefully for positive change. Such stories might leave us in awe, doubting our own ability to emulate these brave examples. But this book features an accessible DIY section which shows, step-by-step, how anyone can take constructive steps to change their own life and learn the skills of resolving conflict. It also includes a comprehensive Resources section. 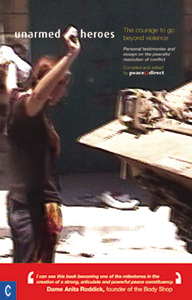 Unarmed Heroes is essential reading: an invaluable tool for the growing global movement of people determined to challenge violent responses to international, regional, local and family conflicts.